Dogs come in all sizes and shapes. Long, short, narrow, wide. Get the best harness for your Tripawd by considering your dog’s body type before choosing any clothing or harnesses. Here’s how to match your dog breed to Tripawd harness for a winning combo. 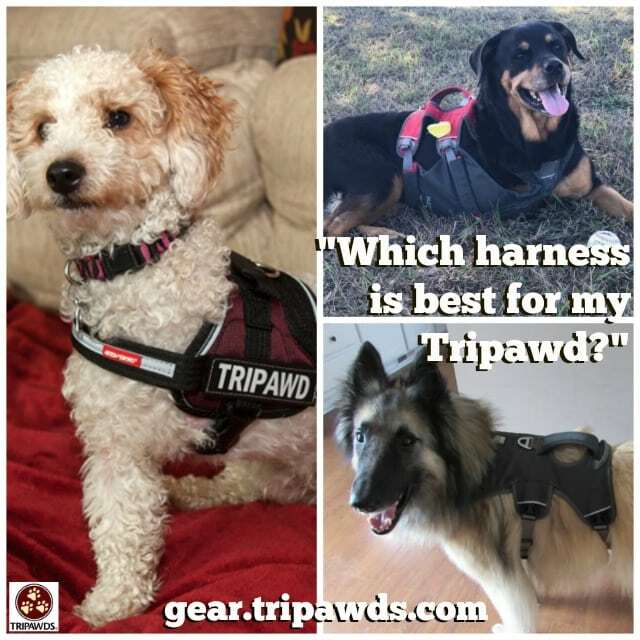 Matching a Dog Breed to Tripawd Harness is Easy! 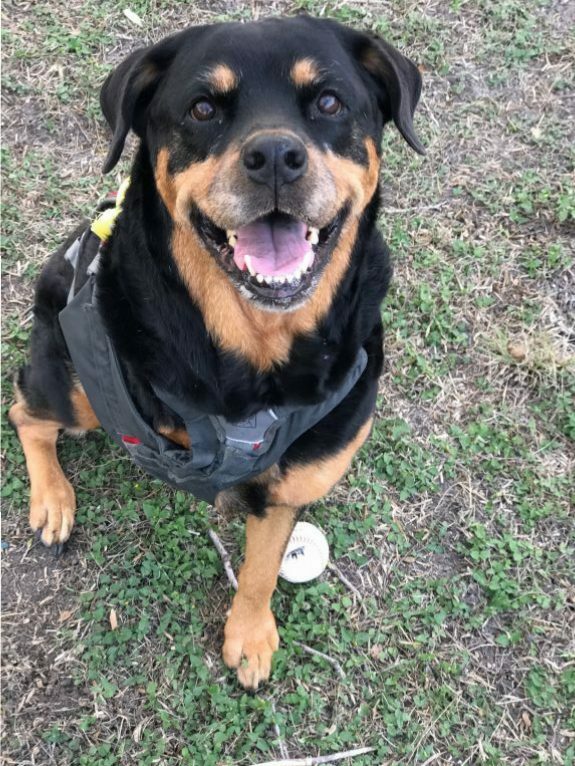 The Webmaster Plus is our #1 Tripawd dog harness for a reason: it doesn’t matter if a dog is missing a front OR rear leg. A handle that’s in the perfect spot. 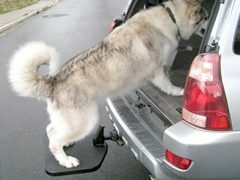 Not too far forward or too far back, it allows us to assist and lift our dogs with ease. Super strong d-ring for attaching a leash. No more throwing your Tripawd off balance by connecting to a collar. 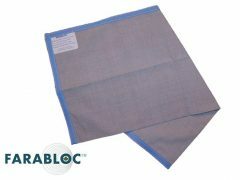 Breathable, durable fabric that’s comfy year-round, no matter the temperature. Front-leg Tripawds have an extra challenge with any harness. That’s because all harnesses slip just a little without two front legs to keep it in place. But the Webmaster slips the least. 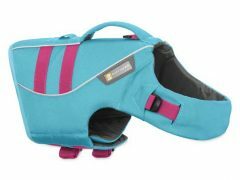 If your dog is long-bodied you may find that even after properly sizing and fitting the Webmaster harness, the handle isn’t far back enough to help you assist. Or if you dog needs rear end lifting, this harness is not designed for that purpose like the Doubleback or Custom Pet Support Suit. Cassidy is ready for a walkie! 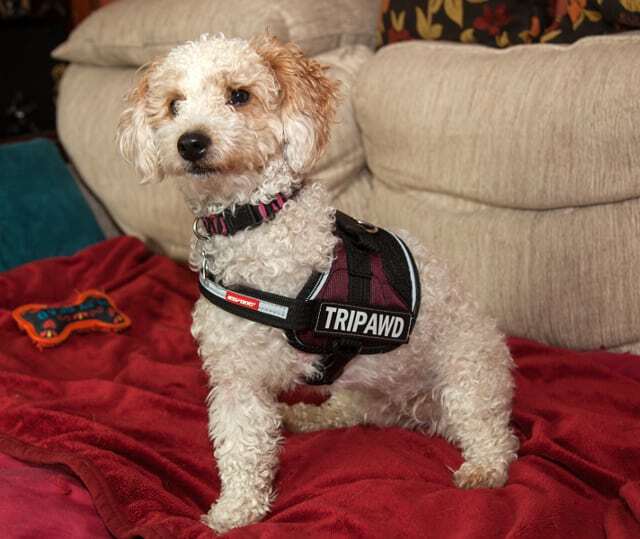 The Tripawd Convert Harness looks great and is a perfect walking harness for all breed types. Short or long, narrow or wide, this harness serves it’s purpose: walking. 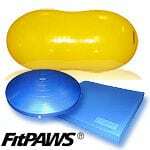 But if you want to use it for lifting, a Webmaster Plus may be a better choice for your dog. Easy dressing. 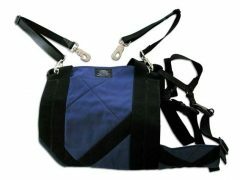 With one strap to buckle, it’s a breeze to put on any front or rear leg Tripawd. Walking. It has a handy ring for your dog’s leash. Put it on and go! And of course the nifty “TRIPAWD” badges it comes with. 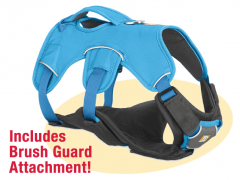 The Tripawd Convert Harness is NOT great for: Hoisting, lifting and assisting. 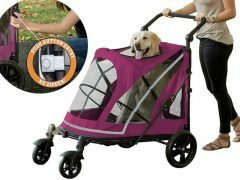 The handle is too far forward for anything more than occasional assistance on stairs, or holding your dog back from chasing squirrels. 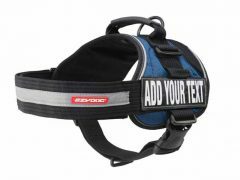 If your dog has a long body, like a Basset Hound, you will find it hard to lift with this harness. Essentially you’re lifting just the front end of your dog’s body, instead of closer to the middle like the Webmaster Plus does. 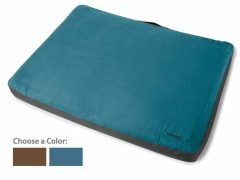 The Ideal Tripawd Harness Solution? Get Both! 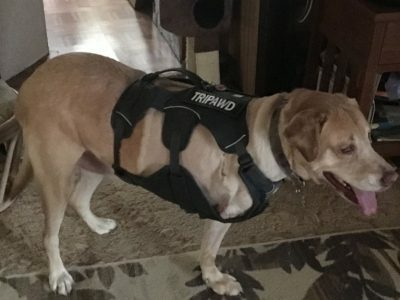 Here’s a “best of both worlds” solution: The Lovely Lab Shelby Lynn’s people did a great harness mod to their Webmaster after buying a Convert harness too. We love how it looks, don’t you?! I have a Great Dane with degenerative myelopathy…. she hasn’t lost her limb, however she has very limited use of her rear end on one side. Looking for the best harness that will support her more. Any suggestions? The same considerations addresses in this post and the others linked to above would apply. Also, the AST Get A Grip or Custom Pet Support is specifically designed for giant breed dogs and those requiring additional assistance.